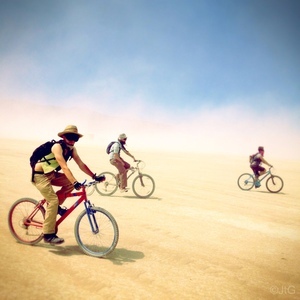 Having a bicycle at Burning Man is crucial, if not essential, to your overall enjoyment and experience within Black Rock City. Given the rapid growth and expansion of the city in recent years, a pedal-powered means of navigation is a prudent, high-priority item when you’re packing. But what kind of bike to bring? Do NOT bring a “good” bike to the event. Dig: the desert will reduce a valuable bike to a rust bucket posthaste. If you must use quality wheels, it’s wise to set aside some coin and time to have it serviced upon returning home–it’ll need the TLC. The playa is notoriously corrosive on unprotected metal, particularly after it rains. At the very least, take along some chain oil for spot lubrication. For improved traction and handling, wider tires generally work out better than road bike tires. Wondering where to get a bike, or where you can get one fixed up? Try these local shops. Affixing a light of some kind to your bike is a critical element for safe travel after dark, especially on certain pedestrian-heavy streets outlining the city. Even on the open playa, where the occasional “dream weaver” may be unexpectedly ambling (or ensconced), a proper beacon could prevent serious injury to either yourself or an unsuspecting playa peregrinator. Help keep BRC beautiful: Decorate, adorn and bedeck your bike with the city’s most prized asset–your imagination. Turn your bike into transportational sculpture or just plain get wacky widdit! This is also a crafty way to avoid unwanted bicycle appropriation. By enhancing or fashioning your own unique two-wheeler, you will greatly reduce the likelihood of its undue disappearance, or will make it more swiftly identifiable and returnable. Please don’t bring your bike to Burning Man Recycling for repairs. They do not have the supplies, equipment or resources to service bikes. Bring your own tools, an extra inner tube or two, some wheel nuts, and be prepared to take care of any problems yourself. If you’re planning a Theme Camp and figure on attracting a crowd, plan to make a bike rack as a courtesy to your neighbors and passers-by. Randomly strewn bikes in a concentrated area make for tricky, ankle-twisting avenues. Our reigning Duke of Construction for the Center Camp Café Racks provides this Bike Rack Construction Manual, featuring drawings, material list, and a step-by-step assembly procedure. Unfortunately, even Burning Man isn’t safe from common — though no less contemptible — thievery, and bikes are an easy target. In the past, a good many bikes have been filched from around the bathrooms. (And you thought just the lines and the odor were bad!) It’s sad, trite, but true–Bring a lock and use it whenever you stop. A good tip: When not in use, secure your bike to your car using a steel cable, running the cable through the tow hook loops on either the front or rear frame bar. Leave no trace. A bike is a BIG trace. Somehow it’s become a common myth (playa legend, perhaps?) that it’s perfectly acceptable to leave your bike behind upon striking your camp. Nothing could be further from the truth. If you pack it in, pack it out!